Home / About Us / Articles / Yoga & Zumba hit the remote islands of Tonga! 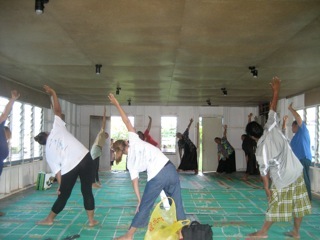 Yoga & Zumba hit the remote islands of Tonga! 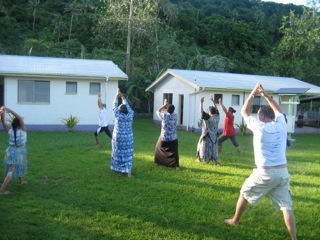 Rotation Update - A little Yoga & Zumba hit the remote islands of Tonga! With our current rotation in full swing, reports and pictures trickling out of the remote islands of Tonga show not only a large number of patients evaluated and treated by our Floating Health Care Clinic, but a couple of new exercise programs were introduced to the local populations to encourage healthy lifestyles… Yoga and Zumba! 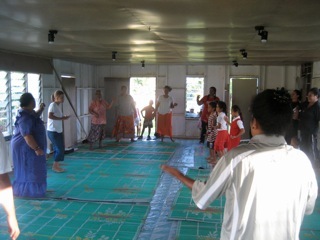 YOGA - Amanda Zeitoun, the wife of our Sea Mercy Captain Xavier, is leading a Yoga class every morning for the local villagers. With the goal of increased flexibility and energy for the local islanders, the hope is that the program will encourage more activity and healthier citizens and help offset the effects and/or occurrence of diabetes (a huge issue in Tonga and across the South Pacific). ZUMBA - Not to be left out of the exercise possibilities, Savannah Andelin, the daughter of Sea Mercy volunteer Dr. Andelin, led her own series of Zumba classes that also drew a large audience and got the heart rates of those participating to a healthy level (including our own crew and volunteer staff). From the reports we have received, both programs were a huge success and will be continued with each rotation. Thanks Amanda and Savannah! If you have an idea for "healthy lifestyle" programs in the South Pacific, let us know!